Why Have I got Fleas? When people mention Fleas they always associate them with being dirty but this is not the case. Fleas are quite happy to thrive in the cleanest of homes and can be introduced by pets, rats, mice, birds’ nests on the property, rabbits, hedgehogs, and even by humans. It only takes a flea to jump onto a pet or yourself and get a ride back to your home, and once they’re in your home they will soon start to multiply and they aren’t fussy who they bite, just because you may have pet fleas doesn’t mean they won’t bite humans! Can you see live fleas,? They are around 2mm in length, brown in colour and jump. Have you been bitten? The bites are normally a tiny dark red spot surrounded by a reddened area, very itchy and last for 3-4 days. Fleas will live on or near to their host. So for instance if you have a dog and suspect fleas check the coat of the dog, can you see the fleas? Brush the hair around the neck in the opposite direction so you can see the skin, again this is an area where fleas will tend to be but you can check all the coat in this way. Check the areas where the dog sleeps as the fleas will live on and around the bedding, you may also see fine black specks. 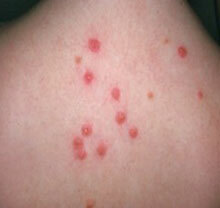 These are flea droppings and again are a good indicator of a flea problem. Fleas will live on the host, on their bedding, even behind skirting boards, door architraves, between floorboards, carpets, beds, settees, virtually anywhere in a home can be a safe haven for fleas. Fleas can lay their eggs anywhere within a property, on the host or bedding. As they aren’t ‘stuck’ to the host they are easily shaken or scratched off which spreads them around the home. A single female can produce between 800 – 1000 eggs in her 2-year lifetime. To produce eggs a female needs a blood feed, the eggs hatch in about 1 week to produce larvae which live around the host, usually on the bedding but again can be behind skirting boards etc. After around 2 weeks the larvae develop into pupae and the adult flea emerges from the pupae around 1 week later. In the pupal stage the flea can lay dormant for up to 12 months, so if you enter a house that has been empty your presence can stimulate the fleas to emerge and bite you. The development cycle from egg to adult is normally completed in 3-4 weeks, especially in heated homes and in the warmer summer months. This all depends on the size of the problem, if it is localised to a pet and in one room off the shelf sprays and dusts can be used in the locality and the advice of a vet for the control of fleas on your pet. with over 25 years’ experience have the knowledge and expertise to rid your home or business of fleas using the most up-to-date techniques, totally safe for your family and pets. There are certain things you can do to help achieve a flea free home; Thoroughly vacuum your property concentrating on all areas, carpets, furniture, beds, skirting boards, architraves, floorboards and any other areas where fleas and eggs could be. Take the vacuum out of the home and carefully empty it into a bin liner, be careful as the fleas will still be alive. It sometimes helps to have a can of fly spray by your side to spray into the hoover bag before emptying. Wash your pets bedding on a hot wash 50c or above, this will kill the eggs. If you combine this with grooming your pets on a weekly basis, then it will help keep your home flea free. Talk to your vet about the best ongoing prevention for your pet. 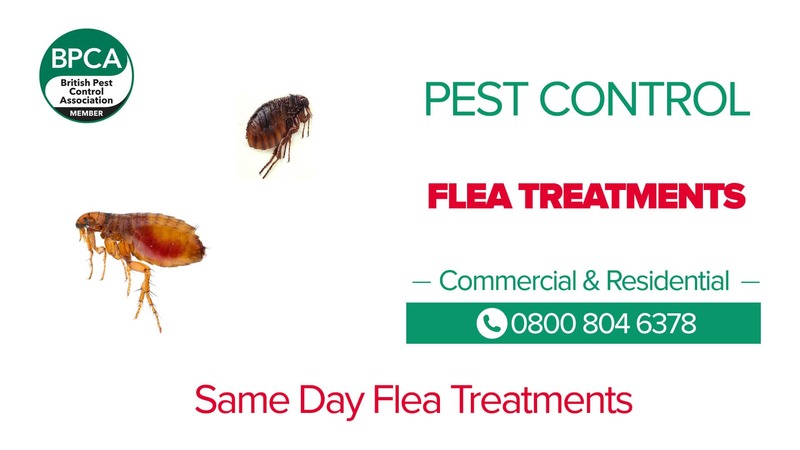 If the flea problem is throughout your home, then a professional treatment will be required. 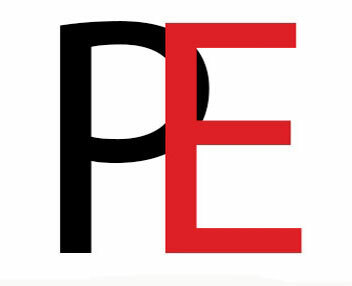 Our BPCA trained technicians with over 25 years’ experience have the knowledge and expertise to rid your home or business of fleas using the most up-to-date techniques, totally safe for your family and pets. The fleas body is flat from base to top, this enables them to move through hair follicles with ease, but difficult to crush between the fingers.